Although today was slightly limited on the thrifting because of work, I am proud to say I did not come out of it empty handed. In fact, I would consider it a fantastic day. After hitting up the local Goodwill (how I love thee), I finally got to check out a new antique shop who's location is simply in the middle of nowhere. It was definitely one worth returning to though. The prices were usually pretty good and the selection was right up my alley. 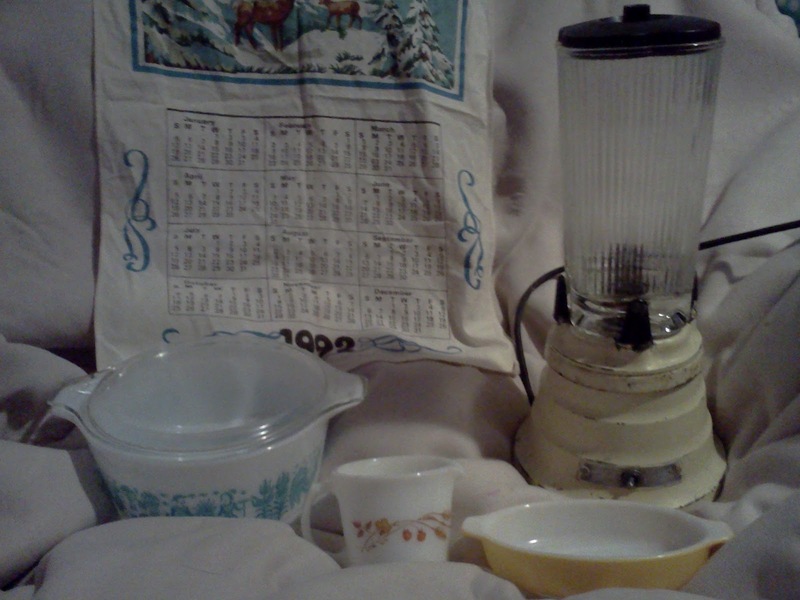 The three Pyrex items were all found at Goodwill. Front and center is a Pyrex brand creamer with a pattern I had actually never saw before﻿... hence the research I will be doing later hehe. Off to the right is an Au gratin Pyrex dish in a marigold color. I haven't seen many of these floating around but when I do I try to grab them if they're a good price; they're so cute. As you can imagine, I was crazy tickled to find the 1.5 qt Amish Blue Butterprint at Goodwill. I absolutely love this pattern but it's usually so expensive in antique store environments. Next up at the new antique store was the 1992 linen towel. Although it would have been awesome had it been older, I couldn't leave it there for only a buck. My favorite find of the day, however, was the vintage Waring blender. I had been looking for one of these for some time now...and there it was...happily sitting one the (Sale!) shelf. So not only was it a great price, but once home I also discovered it worked. Now take a guess who made the reservoir on it? Yuppp, it's Pyrex. The only downside to it was that someone had actually sloppily painted the base a light yellow color. I'm considering doing a bit of a restoration project on it to return it to it's original antique white color though, then it would be a gem. As a fellow Pyrex lover, I am immensely jealous of your Goodwill butterprint find! I'm crossing my fingers that I could find one of those when thrifting some day! I could almost not believe it when I found that one. I was grinning ear-to-ear all day after that. Good luck to you and I hope you find some as well!